Well grown rhodos will be bushy, with leaves covering the whole plant. Poorly grown rhodos are often leggy and bare. The difference usually comes down to maintenance pruning, which should be done on an annual basis. Plan to cut back about 10% of the plant every year. Cut back select branches to a growth point low down in the plant. Cut back other branches to growth points at various heights. You can see where the potential growth points are by determining where one year’s growth ends and another begins, even on old wood. Look down the stems for tiny buds and/or small ridges that go around the stems. Making cuts just slightly above those points will activate the latent buds. By this time of year most rhodos have either flowered, or are about to. Have a good look at the buds and you will see that they aren’t all the same. The flower buds are plump and waiting for the right time to burst into bloom. Non-flowering buds, aka leaf buds, are small and insignificant. 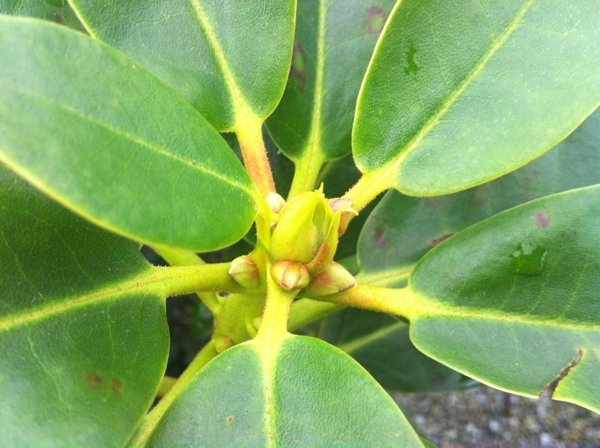 Both types of buds are surrounded by a whorl of leaves and tucked into the base of these leaves are the tiny buds that are future growth points. When flowering is finished, these tiny buds will be stimulated to grow and where there was one shoot this year there could be as many as 4 or 5 next year. However, on the branches with non-flowering buds, i.e. leaf buds, it is unlikely that more than a single shoot will form. As time goes on, the flowering branches will be exponentially bushier, whereas without corrective pruning, the non-flowering branches will be become long and leggy. This is where a technique called ‘leaf bud pruning’ comes in. By pinching out the non-flowering leaf buds, the tiny new buds, that would otherwise stay dormant, will grow. So instead of single shoots forming, several shoots will form. until bloom time. Look carefully at your rhodos and see if you can tell which buds will form flowers. They will be larger and fuller than the non-flowering buds. If you aren’t sure, wait until they are more developed. Carefully pop out the leaf buds with your fingers. Usually you can flick them out with a thumbnail. Be careful not to damage the dormant buds lying around them. When it’s time to deadhead, keep an eye out for long, single shoots and pinch them out at the same time. This will activate the dormant buds around them, which will help to produce a well-balanced and bushier plant. Be vigilant about pruning, especially when the plants are young, and they will grow to be compact and well branched. The added bonus is that by encouraging fuller branching, one also increases the number of flowers. Should major pruning be required, there are a couple of ways to go about it. 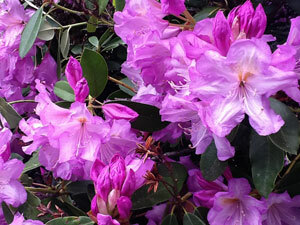 Most rhodos will recover nicely from hard pruning. This can be done either all at once or over a period of two or three years. Normally the best time to prune rhodos is just after flowering, but if hard, renovation type pruning is required it is better to do it in early to mid spring, just before new growth starts. After pruning fertilize, apply a loose layer of bark or leaf mulch and water well. 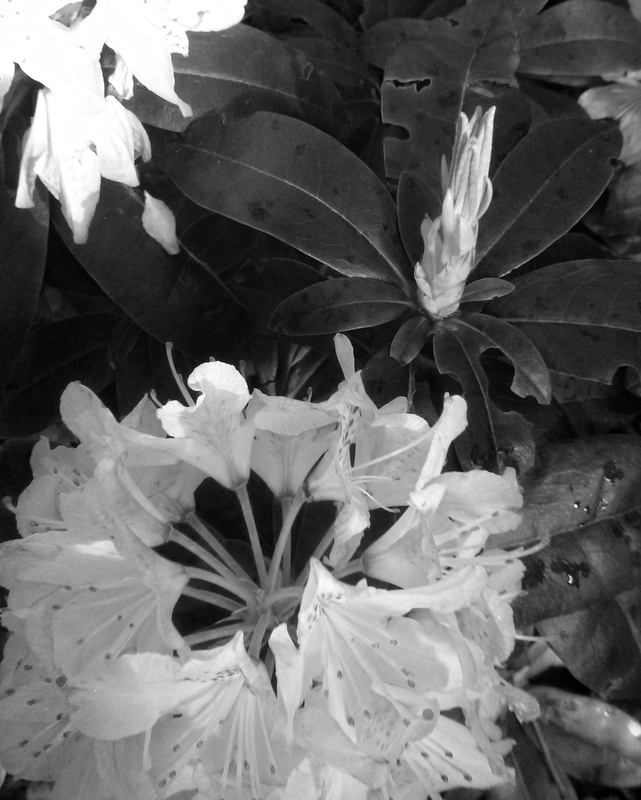 If you have questions about rhodo pruning or would like to be shown what to look for, just come in and ask!